Meow! will be open Sunday, May 22, closed Monday, May 23 for the Victoria Day Holiday. Back Tuesday. Yes, Queen Victoria was fashionable. In fact, she was the main fashion trend-setter of her era. Meow! 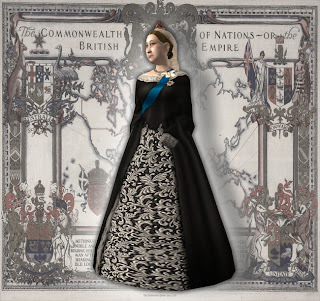 collects Victorian mourning jewelry and postcards but their are so many other aspects to the art and culture of the late-19th Century that were directly inspired by the Queen who gave us Canada!